It sounds like Kyrie Irving has a bone to pick with his coach, Brad Stevens, and some of the young guys on the Boston Celtics. The Celtics blew an 18-point fourth-quarter lead on Saturday night, losing 124-117 to the Charlotte Hornets and their All-Star Kemba Walker. As you might imagine, Irving was less than happy about that turn of events. He didn’t say much to the media after the game, but what he said spoke volumes. 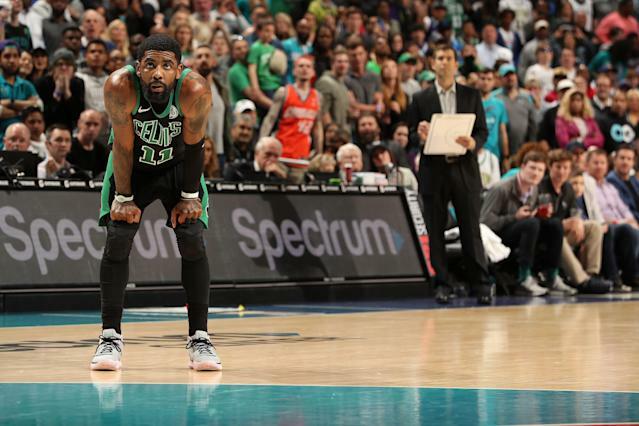 "The game was over in the beginning of the fourth quarter," Irving told reporters, via NBC Sports Boston. "We took our foot off the gas pedal; it got to a five-point game, momentum shifted from there." Walker had 18 fourth-quarter points, all of which were scored during a 30-5 Hornets run that ultimately sunk the Celtics and what they thought was a comfortable lead. Irving lamented the defensive decisions in guarding Walker, presumably chosen by Stevens. Injuries to Al Horford and his replacement Robert Williams III hampered the team, but Irving again emphasized the youth factor on the Celtics right now. "Judge us when we have our full lineup," Irving told NBC Sports Boston. "But obviously when we come out and play like this with a bunch of young guys down the stretch, figuring things out … things are bound to happen but there's no excuses." The Celtics only scored twice during their final 20 (!!) offensive possessions, and Stevens agreed that everything that could go wrong did go wrong. "Obviously, when you lose an 18-point lead, there is a lot of things that go wrong," Stevens said to ESPN. "I thought they did a good job of chipping away at it. [And] we did everything that the book is written on to lose a game that you are up 18 at that point." Is poor defense on Kemba Walker written down in that book? Because Kyrie Irving seems pretty interested in that.